Routine health examinations are necessary. Remember the old saying, "An ounce of prevention is worth a pound of cure?" That happens to be as true for the health of your pet as it is for any member of your family. Annual health examinations will help determine the general well being of your pet and identify potential problems. Early detection ensures prompt action that may solve the problem before serious consequences occur and may prevent suffering. • A wet or dry nose doesn't mean good health - The nose is not the health barometer that some people think it is, but it is a good place to start, Your veterinarian will check your pet's nose for abnormal discharges, and changes in color, texture, moisture, or shape. • Pet's ears invite infection - You'll probably be asked if your dog or cat has been shaking its head or scratching at its ears. Have you noticed any odor from the ears? Your pets deep, curved ear canals provide protection for the inner ear, but these canals also provide a snug home for parasites, infections, and foreign objects. A visual check will be made. • The eyes are the windows to your pet's state of health - Many conditions, such as Anemia and jaundice, often are discovered through eye examinations. Often, cataracts are some of the first noticeable symptoms of diabetes. Your veterinarian also may observe the inner structures of the eye. Problems such as glaucoma, retinal defects or local inflammation may be detected. Injuries, ulcers and lacerations of the eye can also be detected. • Your pet will receive an oral exam - Oral hygiene is extremely important. Your veterinarian will check your pets gums, teeth, tongue, and palate for abnormalities, tumors, and infections. A dental examination is important for detecting gingivitis, periodontal disease, and infected teeth. Teeth cleaning and polishing may be recommended at this time. • Listening to the heart and lungs - Your veterinarian will use a stethoscope to listen to your pet's heart and lungs. If any irregularities are noted, additional tests may be necessary. Early heart disease and respiratory problems are often recognized during a routine health exam. • Reproduction - Your pet's reproductive system will be examined. Your veterinarian will probably explain that spaying or neutering provides many benefits beyond birth control. • Health is sometimes skin deep - The skin is the body's largest organ and a good indicator of your pets health. 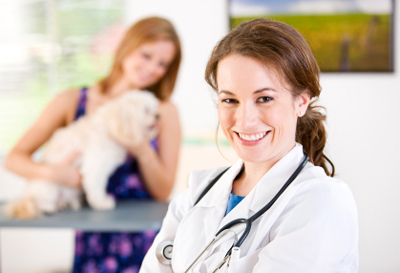 Your veterinarian will examine the condition of the skin and hair as a means of detecting other health problems. Your pet will be checked for fleas, ticks, other external parasites, tumors, and wounds. • Sense of touch - Your veterinarian will use hands and fingers to feel the abdomen. This sense of touch will help to assess the condition of internal organs and to detect tumors or other irregularities. The legs and feet of your pet will be checked. The condition of joints, muscles, skin, lymph nodes, and hair also will be noted. Immunizing your pet against disease is one of the best tools of preventive medicine. Dogs can be immunized against distemper, hepatitis, leptospirosis, parainfluenza, parvovirus, coronavirus, bordetella, rabies and Lyme disease. Cats can be immunized against feline panleukopenia (distemper), rabies, feline rhinotracheitis, calicivirus, chlamydia, feline leukemia and FIP. Health threats vary from city to city and even in various sections of cities; therefore, your veterinarian can tailor an immunization program for your pet based on local conditions and keep your pet protected with the latest vaccines.